Out now for iOS devices in North America! Android and localized territories coming very soon! 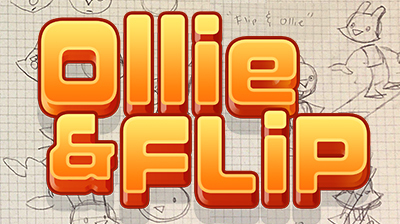 Ollie & Flip - Arcade Snowboarding is a fast-paced mobile title that features the playable characters Ollie the Bunny and Flip the Fox. Players race down winter courses, avoiding obstacles, and launching into the air via snow ramps. The game includes 20 individual challenge levels and an endless “Longtooth Mountain” level where the goal is to score as many points before running out of lives. The game uses simple yet challenging touch controls: drag to steer, tap to jump, and swipe to perform tricks while in the air. 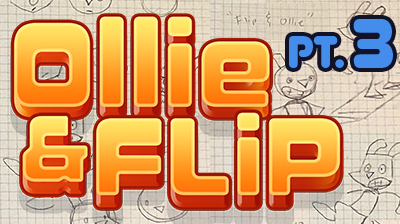 New levels, worlds, and playable characters will be included in future updates. The game is free, with an in-app purchase to remove ads that will also unlock additional playable characters: Toodle the Raccoon and Mollie the Bunny.